After arriving one and a half hours late in Patras, we disembarked the good ship 'Forza' at around quarterpast midnight. 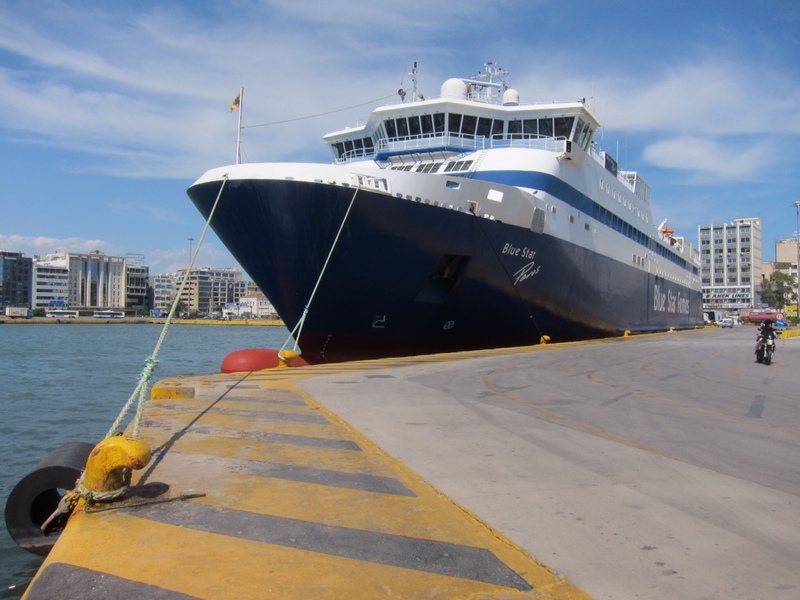 We walked down the gangway to the deserted 'new port' and I asked ( in Greek) a couple who were waiting on the jetty where I could get a taxi…They looked at me in surprise and said.. 'Sorry we are English!' … undaunted we took a punt and headed towards some lights in the distance… and we came to the 'Port Terminal of Patras' as the sign said… I tried to enter thru the big double doors, but they were locked…went around the corner to a small side door and we entered the huge terminal building…totally deserted…no customs, no immigration… no police…they had obviouslly all gone home for the night. Luckily for us, the taxi drivers hadn't, and there were half a dozen waiting outside. 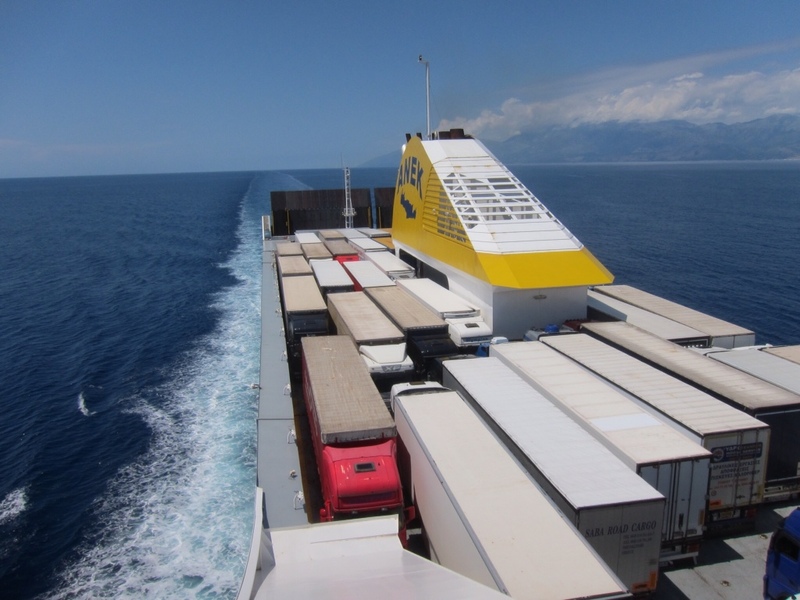 I asked how much it would be to our hotel, but the cab driver gave a Greek shrug of his shoulders and said…'Meter” …which I took correctly to mean he would use the meter…which he did..After about 10 minutes we arrived at the old port and our hotel, the Patras Grand. We received a warm friendly reception, and went to our room on the 5th floor, overlooking the harbour and sea…. I was pleasantly surpised by how nice it was… far beyond my expectations for the price (65 Euro), the room was very large, with a huge balcony/terrace. Pity we were only staying for less than 12 hours. I'd chosen this hotel as it was very close to the KTEL bus station, and we were due to catch the 11:30 express to Athens. After a very comfortable nights sleep, at 9:30 we had really good breakfast up on the top ( 6th) floor. 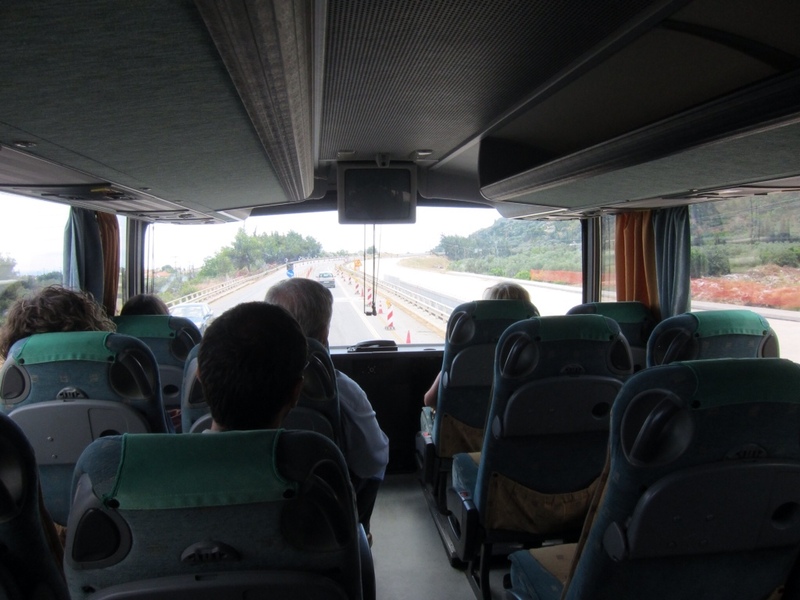 I then went out looking for a 'Cosmote' telecommunications shop in which to renew my Greek SIM card, and also purchase our tickets on the KTEL coach. No problems in finding or getting either, ( Thanks to Costas Demitriades and his Greek language lessons!) although I could not get the front seats as Yineka-mou had asked me to get… When I asked her she threw her hands up in the air in a gesture of exasperation and said “No, don't 'ave…. you are lucky to get seat… is full “) and so at 11:30 we boarded our bus. it was a new double decker ( not like a London double decker…much more streamlined) and we went to our allotted seats upstairs. On the KTEL coach to Athens. YM is sitting in front seat on right. The KTEL bus terminal in Athens, (Terminal A at Kifisou 100) is not a good introduction to the city… it is quite squalid….grimy and graffitti covered….and with many touts offering you taxi services…or trying to sell you fake perfume etc.. your best bet is never to try to jump the Taxi Queue by accepting the touts offer of a taxi… you will pay a LOT extra for the privelige! No queue at the cab rank, so we quickly jumped into one of the waiting cabs, the cab driver switched on the meter, and we were on our way to the port of Piraeus. He dropped us off at the Cafe/Restaurant in the port, nearby to the Blue Star Ferry jetty, and as we had a few hours to kill before the Blue Star Paros was ready for boarding, we had our first lunch in Greece. Not the most salubrious place, and if we hadn't our luggage with us, we'd probably have chosen somewhere different. I ordered 'Souvlakia ke patates tiganites' (kebab and chips, much nicer when said in Greek) and YM had Yemistes ( Stuffed tomatoes with rice) and Koriatiki Salata ( greek salad)…. a cold Mythos beer and a 'miso kilo' of white wine. The food was not the best I've had, though to be fair, not the worst either. it helped that we were quite hungry! 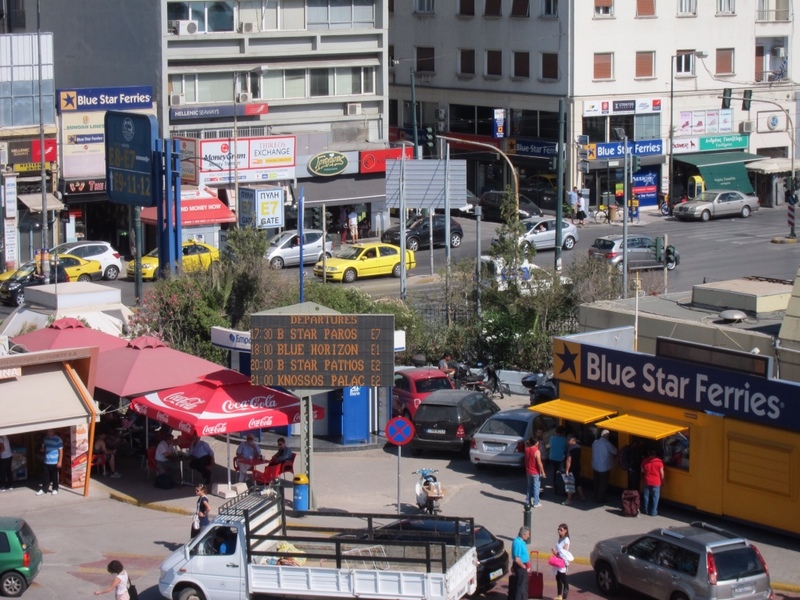 Pireaus, near to the Blue Star Ferries jetty. Pic taken from the back deck of BSP. 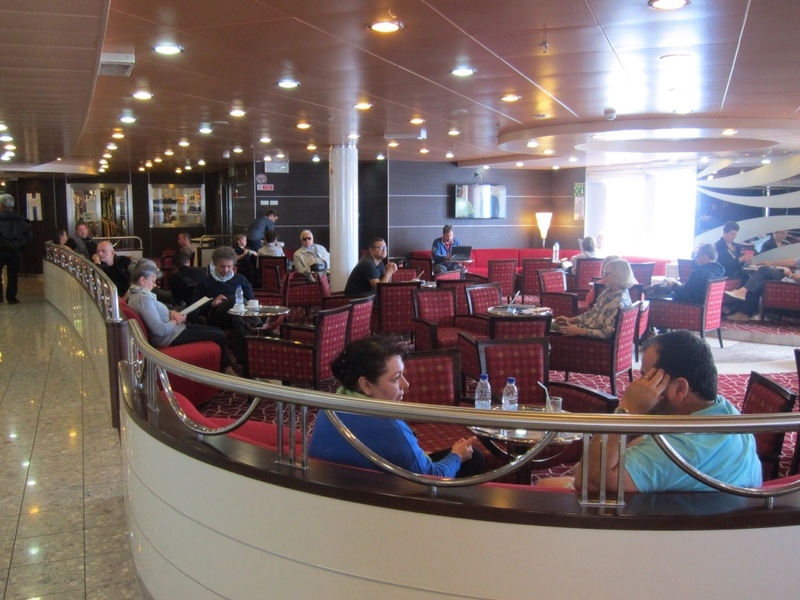 We boarded the Blue Star Paros at around 4pm, and settled in to our comfortable seats in the Business Class lounge, before sailing on time at precisely 5:30pm, bound for the small island of Koufonisia, near Naxos, but in the 'little cyclades' group of islands. My best mate BL was due to join the ship at midnight, when it called into Naxos, enroute to Koufi. Around 30 minutes after midnight, (we were now running late again) YM and I went up on deck to see if we could see BL on the jetty…. sure enough, he was there, and we met him at the gangway. As he'd only purchased a tourist class ticket, YM's task was to smuggle him past the guard and into the business class lounge with us, without getting caught. She'd already been planning this move since leaving Piraeus, and had noticed a 'fire/emergency door' that led up to the crew quarters, through to the cabins, and then out on the open deck. “Follow me” she ordered BL ( BL's quick quip back was to remind her that this usually ended in trouble…for him!) 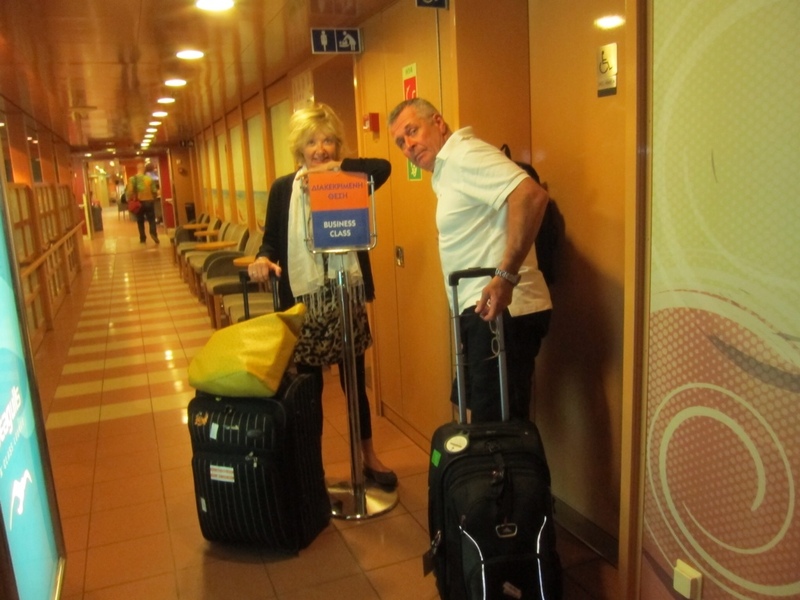 and so off we set up and down stairs, along corridors, thru the crew quarters, and finally down the stairs to the fire door leading into the back of the Business class lounge….We'd made it…thanks to YM and her cunning plan. We still had over two and a half hours to go till we arrived in Koufonisia, and while YM decided to stretch out on the lounge seats and get some shut-eye, BL and I did the resposible thing to do…. help the Greek Economy by ordering some drinks… a nice bottle of Kokkino Krassi (Red Wine) from Paros, and catch up on all the news since we parted company in Barcelona some 3 weeks ago. On arrival at 2:45 am in the morning, we were met at Koufinisia by Florian, the same Albanian guy who featured in my blog from last year. A quick 2 minute drive from the port, via a shortcut acros the town beach, and we were back again in paradise…. AKA 'Gitonia tis Irinis'. YM and I had the same room, Anna Giorgia, as before, while BL was given a choice of rooms, and settled for the room called Parthenes. It just so happened that I'd called Florian yesterday to remind him to put a couple of cold Mythos beers in the fridge. He went one better than this by leaving me a case of 20 x 750ml bottles…… Thanks mate, I LOVE Albanians! By now, we were all over being tired, so ( stupidly?) sat up until after 5am talking, drinking and reminiscing until the sun came up. 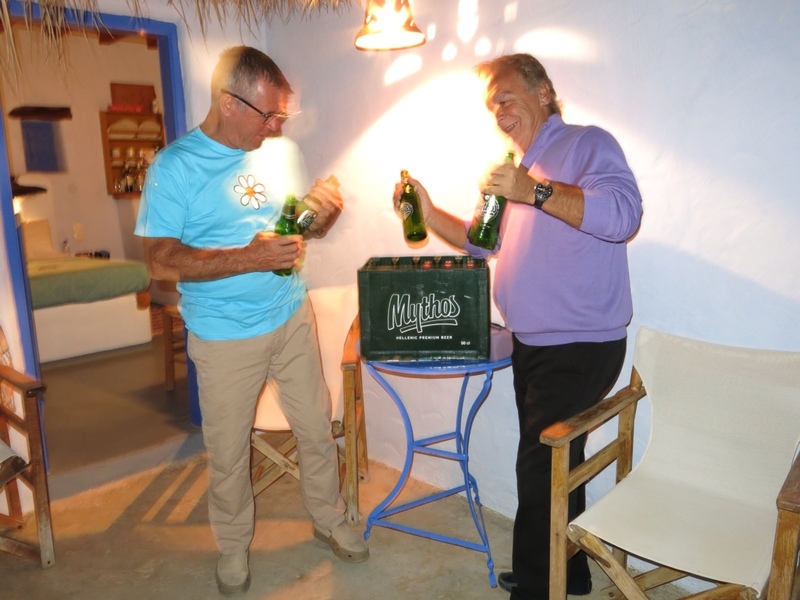 Seems like a great trip…Lots of Mythos and lots of late nights! No trip would be complete without a front row seat on the bus for Mum! !